The music of passion, cruel environment, give you different challenges in this game. If you like the crazy things , it is your tip. In the cold winter, a heavy truck on the hill, hard drive, want to across the heavily covered ice mountain road is not easy, step carefully, your truck will be smoking. So in the game you need to control the direction and speed of the truck, don't let it tipping is the best. As a reminder, the ground is very slippery, so it is not easy to oh. Under such circumstances, you can reach that level, might as well try. 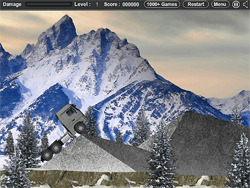 You can play Truck Trial Winter free online truck games at fogames. It has tags: Driving,Side Scrolling,Truck,. It has 1758 total plays and has been rated 80.5% (2 like and 0 dislike), find the fun and happy day. If you want to play more truck games, we find some of the game: Winter Firefighters Truck, Bowmaster Winter Storm, Truck Loader and Winter Firefighters Truck 2. To play other games, go to the driving games page, the side scrolling games page, or just check out the new games or best games page. Play Truck Trial Winter online games, Fun and Happy.